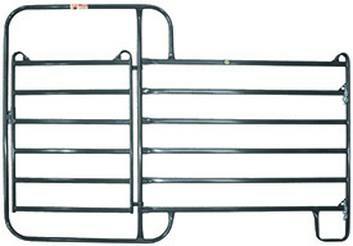 "Tough Enough for Cattle, Safe Enough for Horses," these uniquely designed panels feature a 4' wide "walk thru" gate and are ideal for a number of applications around the farm or ranch. Constructed from our patented Quadraform(TM) tubing to allow for maximum strength and flexibility, these panels are suitable for use in crowding situations. These panels feature chain connectors to ensure tight connections and offer increased versatility to allow for easy connections to existing structures. J-legs increase the ease of portability and help keep panels from sinking in to wet or boggy ground, while our "Fishhook" top corners increase strength and safety. The Architectural Grade Powder Coat Finish helps the product to resist rust, scratches, and fading to add years of life to your investment.